The layout dialog makes it easy to format your scores any way you feel fit. Minimum note distance determines the minimum spacing between notes on a line. 100% is the default at which the shortest notes are one unit apart. Maximum note distance determines the maximum spacing of notes on a line. 100% is the default at which the longest notes are 4 units apart. Fixate the desired number of bars per line. Note that an upbar will not be counted. Explicit line breaks will accommodate for earlier breaks, and changing the bar number on hard bar lines can add an extra bar. 0 allows MusiCAD to fit as much as possible bars on a line (default). Any line that is not filled for at least the percentage supplied here be right-justified. If set to 100% a ragged right margin will be the result. Conditional line-breaks in the rest of the line will render effective, within the percentage they will not. Fixed height of a staff in vertical units. Setting staff-height to 0 will call for automatic staff-height. Minimum distance between two staffs in a score in vertical units. Fixate the number of lines per page. 0 allows MusiCAD to fit as much as possible lines on a page (default). At any page break MusiCAD may distribute the remaining vertical whitespace over the existing lines of a page. Within the page-area outside percentage supplied any conditional page-break will render effective. Fixate the header height to the number of vertical units which may be 0 for calculation by MusiCAD (default). Fixed height of the headers on other pages than the first. 0 for automatic calculation (default). Fixed height of footers. 0 for automatic calculation (default). Indentation whitespace at the beginning of the first, resp. other lines. Any lines terminated manually, as well as the last line of the score might have less notes than the other lines. To enhance the layout MusiCAD can spread notes of these 'orphan' lines the same way as average lines. Note-stems are usually drawn such that any single note will have a length of 7 vertical units, one unit less the the height of one 5-line staff. If you need smaller or larger stems this is the place to request your needs. Ledger-lines (the extra lines drawn outside the staff when drawing very high or low notes) should not be too wide or too small. If you'd like to have them wider enlarge the percentage. 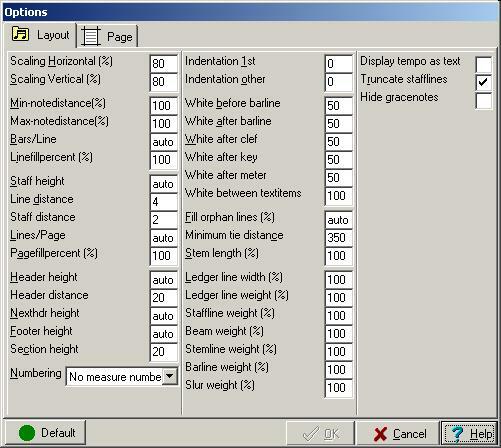 You may accommodate (enlarge) weight values if your eye-sight is decreasing of when you need to fax or scan music-paper.